PROFILE OF HEARING MORBIDITY AND IDENTIFICATION OF BARRIERS AND CHALLENGES FOR ACCESS TO EAR AND HEARING CARE SERVICES IN CHILDREN OF URBAN AND RURAL AREAS OF DELHI. Appointment of Chief Operational Officer: At the beginning of the year, Dr. Bulantrisna Djelantik was appointed as the part time COO of the Society for Sound Hearing to back up the implementation of activity plans of the Executive Committee. She is based in Indonesia and is supported by part time accountant. Developing prototype and field tested a country publicity materials: Posters were developed through the collaborative efforts of the members about the Sound Hearing 2030 concepts. This has been field tested and validated by experts from the Public Health Department of Maulana Azad Medical College. All these 15 posters, 6 pamphlets and 2 flip charts have been uploaded on the website and is available freely for download and use by anyone in any country. Developing & maintaining accessible website: A fully accessible website: www.soundhearing2030.org has been developed professionally under coordination of Dr Shelly Chadha with the assistance of COO and EC members, and is fully functional. 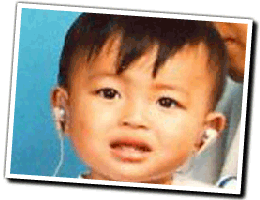 Besides an introduction to Sound Hearing and its activities, it also contains awareness material for download, latest activities, recommendations and guidelines as well as articles for the lay public. The First Conference of the Global Coalition for Hearing Health, Washington, USA, in July 2010 was attended by the President, Dr. A. K. Agarwal. The 3rd Shanghai International Otology & Audiology Conference in connection with 11th Hearing International Annual Meeting, was held in Shanghai, China in October 2010. Dr. Agarwal represented Society for Sound Hearing. An International Course on Epidemiology of Hearing Loss was held at Bangkok, Thailand and organized by the WHO Collaborating Centre in Bangkok with support from WHO SEARO. Dr. Rakesh Shrivastav, Dr. Ronny Suwento and Dr. Shelly Khanna Chadha were faculty for the course. COO has participated in the Internatonal Fundraising Conference (IFC) in the Netherlands 19-22 October 2010. The conference is very informative and inspiring. The COO has registered as member of SOFII, an online networkof the IFC organization, that continuously distributes information and tips from charity and fundraising experts. Participation of Sound Hearing in the 2nd International Deaf Expo held in New Delhi on 14-16th December 2010 an organised by a number of Deaf person's organizations within India. Development of Guidelines regarding Inclusion of Hearing Impaired in India: These guidelines have been developed through a consultative effort of experts in the field of Inclusion, Education as well as subject experts. 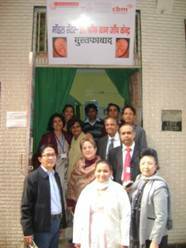 A workshop was held in New Delhi under coordination of Dr MNG Mani, to finalize the guidelines in December 2010. The guidelines are currently being validated by a larger group of experts. Continual efforts to develop alliance with WHO SEA & HQ. Meetings with WHO had been held at the WHO SEARO in July regarding MOU between WHO SEARO and SSH. Response from WHO legal department regarding further action to be taken is awaited. Pilot project for operational research in HI and Blindness program: A pilot project to develop a replicable model of integration of ear & hearing care services with existing eye care services is being developed. Currently this is being field tested at two 'Vision centres' in collaboration with the 'Shroff Charitable Eye Care Hospital' in India. The vision technicians at both the centres have undergone training in Ear & Hearing care services and are now carrying out screening, referral and awareness activities in the community. Registeration as International entity: The Registeration in HongKong is coordinated by the COO through liasoning with Dr. Brad Mc Pherson, of the Hongkong Centre for Communication Disorders, Faculty of Education, The University of Hong Kong and member of the International Society of Audiologists. Local legal experts have been identified and a document for undertaking the required procedure to gain a charitable organization satus have been prepared and filed. The opening of the international bank account is expected to be completed in the early part of 2011. 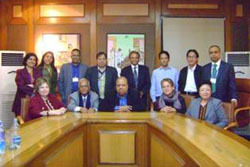 The 9th annual Executive Committee Meeting 2010 was held at Maulana Azad Medical College on the 9th and 10th December 2010, attended by 12 EC memebers, the focal point at WHO SEARO Dr Sara Varughese. On the first day, two experts from CBM: Mr Murali Padmanabhan and Ms Lisa Johnson gave presentations in the Workshop on Inclusion of Persons with Hearing Impairment. Progress reports, orgsnizational issues, approved budgets, were discussed as well as planning of 2011 activities and the "International World Conference on Community Ear and Hearing Health Care" to be held in 2014. Needs assesment for National Committee strategy paper was developed and used as framework for organizing the India National Worshop for Strategic Planning at the Maulana Azad Medical College in New Delhi India, 11th december 2010. Seminar on Prevention of Deafness & Hearing Impairment in India: A strategy plan was held in New Delhi on the 11th of December 2010 and was attended by 32 national experts representing all stakeholders in the community ear and hearing health care in India, governmental, academic, professional and private entities as well as the Society for Sound Hearing executive committee members. 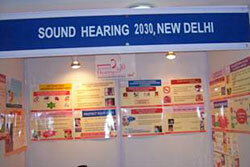 It was organized as a joint venture of Sound Hearing with Govt. of India. This has to the development of the future strategy in this regard for India. Completing the development of multi-level training modules: The WHO Training Manuals for Community Ear and Hearing Care are being adapted for 4 levels of trainings under coordination of Dr Shelly Chadha. The modules include a series a power-point lectures for each of the levels of training. After completion, this will be field tested and validated by other experts, then uploaded on the website. The developed modules include a number of illustrations and animations developed by Sound Hearing 2030. The process is still on and will be completed in 2011.